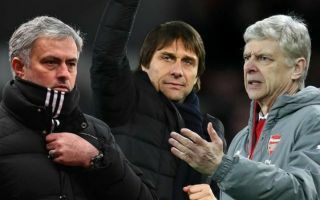 Jose Mourinho, Antonio Conte and Arsene Wenger are all reported to have rejected the Real Madrid job following recent departures from Manchester United, Chelsea and Arsenal, respectively. Mourinho was only sacked by United last month, while Conte and Wenger have been out of work since last summer, but Don Balon claim they’ve all turned down offers to solve the crisis at Real Madrid. The report lists a variety of reasons for all three, but it seems none were keen to come in and attempt to steer the ship at the Bernabeu in the middle of the season. It’s been a poor season for Madrid, who brought in Julen Lopetegui to replace Zinedine Zidane in the summer, but sacked him early on in this campaign after a poor start. Santiago Solari has since come in and not done a great deal better, with a big name now surely needed as soon as possible. However, it seems Los Blancos will have to wait until the summer to sort things out in the dugout.